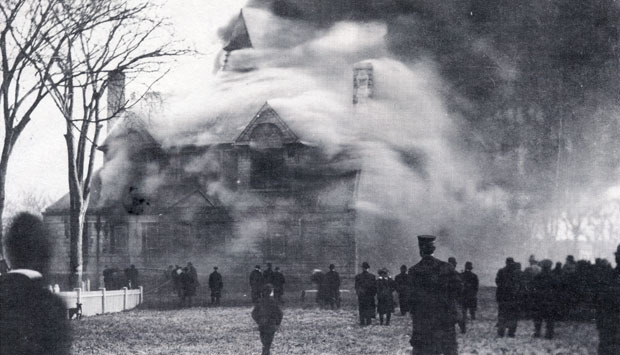 "The fourth meeting house of the First Parish Congregational Church fell victim to a fire on the morning of February 21, 1909, in what was described by the Wakefield Item as 'one of the hottest and most spectacular conflagrations in the history of the town.' As the photograph shows, 'thick, black smoke poured forth in volumes throwing a heavy pall over the whole easterly side of the town from the square to Lakeside.' The fire was driven by high winds which shifted from north to west '...sparks flew in showers on the dwellings on Common Street and on the streets on the easterly side of the Park and the Common - Crescent, Bryant, Park and Salem.' It was also reported that roofs were wet down, but in spite of the precautions, several caught fire, among them the residences of Chester W. Eaton (at the corner of Main and Park Streets) and Chas. A. Cheney, as well as the Emmanuel Episcopal Church. At noontime, four hours after the fire was first spotted, all that remained was a corner wall and tower. The church was rebuilt and rededicated on February 1, 1912." - Text from calendar by Jayne M. D'Donofrio. “First Parish Congregational Church, looking east on Church Street, 1909,” NOBLE Digital Heritage, accessed April 22, 2019, https://digitalheritage.noblenet.org/noble/items/show/6944.